The author unexpectedly becoming part of an exhibit at the Wellcome’s ‘Foreign Bodies – Common Ground’ exhibition in Miriam Syowia Kyambi and James Muriuki’s installation ‘Pata Picha Studio’. Today, I belatedly visited the ‘Foreign Bodies – Common Ground’ exhibition at the Wellcome Collection. The exhibition presents the work of the ‘Art in Global Health’ scheme, during which six artists undertook residencies at scientific research centres around the world: Kenya, Malawi, South Africa, Thailand, the UK and Vietnam. Despite their different local contexts and artistic approaches, the artists shared a common concern with the tensions between ‘experts and ‘lay public’. The (giant!) exhibition booklet emphasised the ‘exclusionary hierarchies and impenetrable languages’ produced by specialisation – whether it is disciplinary boundaries (where even experts cannot understand one another across fields) or the ‘ivory tower’ image of research. While this theme is not new, the exhibition recognises correctly that the problem persists and continues to call for new approaches that address local contexts. Behind the scenes of Pata Picha. One of the memorable images from a film in the exhibition showed a stark contrast between a high tech research centre that was located right across from a field of improvised shacks where poor, local people lived. Such contrasts prompted the question of possible interactions (or obligations, as scientist Michael Parker put it) between locals and researchers, which the some of the artists took as starting points. In many ways, the artworks, and especially the processes that lead to them, sought to operate as bridges. In the exhibition, this bridging between discourses was frequently symbolised through resituated ‘boundary objects’: labcoats that contained elements of Kenyan dress (see photo above), laboratories that are crossed with living rooms, surgical gloves that float in the air like fragile jellyfish. Other means of translation included physical theatre, as in the work of the B-Floor Theatre from Bangkok, participatory photography, as in the work of Zwelethu Mthethwa, or housing decoration, music and language inventions, as in the work of Elson Kambalu. As the exbibition commentary emphasised, translation is often not only needed between researchers and the local lay people, but amongst researchers and locals themselves: both locals and researchers were made up of different ethnic groups, speaking up to 24 languages amongst themselves. In addition, some of the artworks dealt with the scepticism with which the so-called ‘non-experts’ encounter scientific intervention. Examples included Lêna Bùi’s ‘feather sorters’ in a Vietnamese village who only reluctantly participated in the artwork after their negative experiences (enforced change of practices, relocation of industry, job loss) with avian flu management. Despite their geographic removedness, the experiences of the feather sorters are likely to resonate with farmers who were negatively affected by food and mouth disease or BSE management strategies. Common ground, indeed! Double still from Lêna Bùi’s ‘Where birds dance their last‘. Source: Wellcome Collection. A further theme that ran through the exhibition was proliferation, expressed through the ‘spreading’ of ideas and viruses. Scientists interviewed in the films (show on small screens dotted around the exhibition) frequently mentioned that they feel that they are agents in a ‘messy battlefield’: they get a sense of the organisms’ desire to live while they are trying to find ways of protecting their own species against it. Further, they emphasised the need to explore things at a societal as well as a ‘micro level’, as microbiologist Peter Piot suggested. Indeed, the ‘modern demands’ could be described as one of those societal pressures that change a myriad of practices – and intimacies. Some of the installations focused on such changing relations, as well as the possible two-way direction of this transformation: what consumption and production practices promote less disease (modern? traditional? is the mixture the problem?)? What is modern medicine teaching to ‘developing’ countries? What is it learning from its previous interactions with these countries to improve its ethics or communication? What kind of assumptions does ‘modern medicine’ hold about ‘traditional medicine’ and its different kinds of intimacy? There is one poignant example in the booklet where a researcher looks the drawing of a rhino in a medicine-related painting and wonders whether it signifies some superstitious believe in the medicinal properties of rhino horn. It turns out that the painter of the rhino added it to make the scenery ‘less boring’, thus making the researcher question her own expectations. What struck me during the exhibition was the installations’ ambition to function as a two-way engagement: the pieces had to work in the local as well as the Wellcome context. I thought about how some of the most engaging artworks in a local context might not necessarily make an equally engaging exhibition object (one could argue, of course, that art does not have to ‘work’ in the same way in different spaces – see e.g. the ‘relational aesthetics’ debate – but that requires another blog post!). For instance, the comparatively static representations of sculptures, photographs and theatre-on-film communicate their ideas, but perhaps do not involve exhibition visitors to the same degree as the people who were involved in their production. This was partly ‘remedied’ by the presence of Wellcome staff who involved visitors in discussions (or vice versa). During my visit, for instance, a lively discussion evolved around Katie Paterson’s ‘Fossil Necklace’, a necklace made of chronologically arranged fossil beads that emerged from her work in a Cambridge DNA lab. Like me, other visitors were struck by the way the magnifying glasses, that were distributed at the entrance to the room in which the necklace was exhibited, made the fossil beads look like planets: each geologic period appearing as literally another world. Detail from Katie Paterson’s ‘Fossil Necklace’. Source: Wellcome Collection. In case you want to visit – and experiment – in the exhibition yourself, ‘Foreign Bodies – Common Ground’ has been extended until 16 March 2014 (thanks Russell Dornan for the info!) at the Wellcome Collection in London (opposite Euston Station). Free entry! Two types of invitations seem to be floating into my inbox with increasing frequency, for talks and exhibitions on the Anthropocene and Afrofuturism respectively. The latter was the subject of Union Black/The British Library’s Space Children, Kosmica’s ‘Astroculture’ event at the Arts Catalyst, Tate Modern’s Afrofuturism’s Others and the Photographers Gallery’s Afronauts by Cristina de Middel. Afrofuturism even cropped up at UCL’s interdisciplinary Cosmologies symposium as an example of a ‘dissident cosmology’. As discussed in a previous post, much Anthropocene themed art uses geology as a starting point to re-think the human as a geologic agent. Afrofuturism, by contrast, (re)imagines African (especially African diaspora) pasts and futures through flamboyant scifi and spiritual aesthetics. Canonical examples include the music Sun Ra, Parliament Funkadelic, Nona Hendryx and Drexciya, the writing of Octavia Butler, Nalo Hopkinson and Samuel Delaney, and the art of Jean-Michel Basquiat, Rammellzee and Renée Cox. Or, in Anthropocene terms: rich White people cause disaster, poor Black people are its victims. While people in the ‘global North’ indeed have a disproportional share in furthering climate change, such framings have led to warnings about a potential resurgence of ‘old… tropes of racial capability’, as issued, for instance, by Yasmin Gunaratnam and Nigel Clark. Rather than trying to silence the debate, they call for an exploration of ‘the ‘primitivism’ inscribed in our bodies, psyches and cultures’. It is such inscriptions of primitivism that Afrofuturism plays with, not only regarding African cultures, but all cultures. The play with Egyptian origins and aesthetics by Sun Ra and Ellen Gallagher exemplifies the historical struggle over cultural legacies and the construction of ‘high culture’ and primitivism. Although often humorous in nature, the Egyptian imagery points to questions about whom this construction continues to serve and about how it can be rewritten. The origin of Afrofuturism in the ‘global North’ further contributes to the cultural challenge. As South African digital artist Tegan Bristow phrases it: ‘[u]nlike what it suggests, Afrofuturism has nothing to do with Africa, and everything to do with cyberculture in the West’. Seen from this angle, the origin as well as the necessity of the term ‘Afrofuturism’ underscore the fact that the ‘African’ and African diaspora have routinely been excluded from ‘modern’ and techno-futurist visions and set apart from the ‘mainstream’ (there is an excellent talk by Madhu Dubey on this topic here). Here I am reminded of Octavia Butler’s response (around 7 minutes in) to a White science fiction author who argued that there is no necessity for Black people to appear in their novels, because statements about the Other can be made through aliens. In an inversion of stereotypes, some Afrofuturist commentators highlight the ‘primitivism’ of a science that seeks to classify the ‘primitive’, pointing to mainstream science’s contribution to racism and genocide at various moments in history (examples can be found in Alondra Nelson’s book Body and Soul and in this catalogue on Ellen Gallagher). Dipesh Chakrabarty on ‘History on an expanded canvas: The Anthropocene’s invitation’ at Haus der Kulturen der Welt, Berlin. Similarly, the Anthropocene discourse practices inversion as a strategy to unsettle visions of modernity and to search for new models of human agency. Although scientists have not been able to agree on a potential beginning for the proposed new era, the industrial revolution and its heavy reliance on fossil fuel consumption remains a strong contender. When it comes to our (primitive?) dependency on these energy sources, scientists and social scientists have started to re-examine preconceived notions of cause and effect: are fossil fuels shaping human society and not the other way round? (Yusoff, Moore, Roddier) What kind of agency do humans have to affect social and environmental change? Are new strategies in order? Again, such debates, draw on arguments about our current interpretation of ‘modernity’: what kind of ‘rationality’ should modernity (and ‘modern science’) follow? Do ‘subaltern modernities’ reflect a more accurate vision of modernity? Can humans see themselves as a ‘species’? Turning back to Afrofuturism, sociologist and writer Alondra Nelson suggests that it represents more than a critique of modernity – it is about ‘aspirations for modernity’. Rather than dwelling on the negative, it ‘enables thought about a lineage of work that propels future other work’ that co-shapes the future. It is occupied with the ‘living future’ (to use Barbara Adam & Chris Groves’s term), the potential for different futures inherent in the present. One trajectory that Afrofuturism pursues is a reshuffling of difference. According to Nelson, popular interest in genetics and the potential discovery of links to previously unknown, geographically distributed ancestors, is, despite its focus on physical difference, already unsettling and reshaping identities, both at the micro and macrolevel (audio here). In this context, an important question was asked at the Tate Modern, in conjunction with artist Ellen Gallagher’s AxMe exhibition: who can be an Afrofuturist? Entitled, ‘Afrofuturism’s Others’, the organisers, panellists and audience explored whether Afrofuturists could be anything other than African American. In discussing the work of Kara Walker, Lili Reynaud Dewar, Larissa Sansour, Mehreen Murtaza, Jean Genet, Ellen Gallagher and others, the case was made that Afrofuturism contemplates an absence of racial and geographical boundaries. In particular, the speakers considered the problematic, but also potentially productive relation between racialization, as turning certain humans into part of the ‘productive landscape’, and ‘species being’, which is also a materialisation, but one that can go either way in terms of dealing with difference (the work of Sylvia Wynter was mentioned). The works discussed included examples of deliberate and accidental solidarities: art and music that referenced ‘Afrofuturists’ or became interpreted as ‘Afrofuturist’ on the basis of aesthetic (mis)interpretation (curator and co-organiser Zoe Whitley described a humorous encounter where she misread a painted black figure as signifying ‘Black’). Here, a second trajectory seems to emerge that asks not only ‘what is ‘afro’, but ‘what could the ‘afro’ be and do?’ This takes us to the ‘Africa is (not) a country’ awareness campaign (example blog here). As many African Americans point out, the slavery system often deprived them of more detailed knowledge about their ancestry other than ‘African’. At the same time, the ‘African’ has acquired meaning for the community and is increasingly also tied to particular political imaginations. During my visit to Detroit, I found that African American activists were talking about promoting an ‘African model’ of community and of reshaped institutions against the ‘White corporate’ model. At a film screening of Branwen Okpako’s ‘The Education of Auma Obama’ at the Ritzy cinema in Brixton, African visions of trajectories for modernity again came up, prompted by Auma Obama’s discussion (in the film) with Kenyan students about the kind of lifestyles they are hoping to pursue. Obama asked her students to consider what premise notions of ‘progress’ and ‘development’ are based on. Development of/towards what? Industrial farming, increased levels of consumption, loss of community? Why could certain ‘African’ models of living not hold the key to human development? Seen through the lens of Afrofuturism, one could say that if the ‘afro’ can be shaped into something coherent, this move does not necessarily imply a wish to do away with nuances and differences. Instead, it could be read as a productively employed and reframed cliché that critiques a privileged socio-economic model. Its future trajectory could indeed transcend its current context. The question here might be phrased as: can established categories be rejected by getting contemporary ‘non-Others’ to adopt the model that is normally deemed ‘other’? The corresponding Anthropocene question might be put as ‘what could the ‘geo’’ be and do? The logic seems to be that if the human can be a geologic force, how else is human life geophysical – and how could this perspective lead to a more constructive reframing of politics and the social? Especially since, thanks to climate change, the stability of the ‘meteorological White middle class’ (as a recent German TV satire described Europe) might become seriously unsettled… So far, quite a few proposals have tried to put human politics into perspective: we might do all these politics for economic power – but at the end of the day, when oil is used up, the water is polluted and the temperature is up, our role as a geologic force might be unsatisfactorily short. Shouldn’t humans work more in cooperation in the face of geophysical processes that will carry on without consideration of human needs? It is interesting to note that some of the most interesting proposals have again been excluded from the ‘mainstream’ and have been consigned to the area of ‘post-colonial ecologies’. I am thinking here especially of French-Caribbean discussions of geopoetics (Maximin, Glissant, Condé etc). Conversely, scholars from post-colonial studies, such as DeLoughrey and Handley, have criticised that ‘Westerners’ are in search of ‘Other’ models to bring a much needed conceptual injection. This debate raises questions about the conditions under which dialogue should take place. For me, visiting Ellen Gallagher’s exhibition at the Tate Modern (on view until 1 September 2013) synthesized the dialogue between Anthropocene and Afrofuturism even more intensely (enter the ‘Afrocene’?). Walking through the different rooms, I was struck by what I experienced as a ‘hypermaterialisation’ of layers and layers of material and meaning. 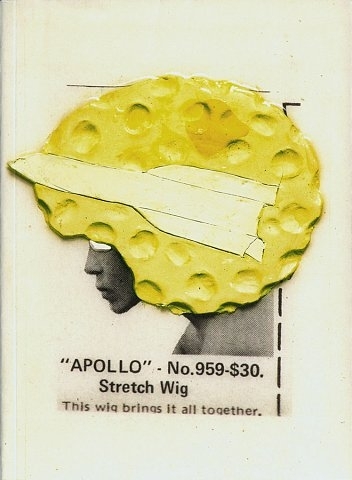 Many art critics have commented on her relationship with the material, for example, Gallagher’s wish to ‘maintain the ‘vulnerability’ of her materials and their forms’ (Shiff), her use of African American wigs as a conduit to the supernatural (de Zegher), but few manage to capture the intensity of an entire retrospective. Robin Kelly comes the closest: he describes his encounter with Ellen Gallagher’s work as ‘confounding’. I don’t think any term could be more accurate. To me, Gallagher’s shifts between meanings of medicine and wig adverts, ‘high’ and ‘low’ art/culture references, ‘nature’ (I especially loved the title ‘Double Natural’) and ‘blackness’, marine creatures, minstrel imagery, ambiguous organic shapes and political pamphlets rendered tangible the multiple ways in which people are being materialised and enlisted as part of social and economic production: overworked and stuck in a job you cannot get out of? Pop a pill. More ‘organic’ than society’s ideal? Neighbours throwing bombs into your house? Buy a wig. Keep calm and carry on. The sheer ridiculousness of the enterprise as well as our complicity in it becomes apparent. Does Gallagher suggest any way out? It seemed to me that she was perhaps implying that the path towards more productive forms of materialisation may lie not only in realising the ridiculousness, but to start from it. Geology and politics? Ridiculous! Africans in space? Ridiculous! A more equal global society? Ridiculous! Or is it? ‘In this talk artist and academic Raphael Jay Adjani, discusses the concept of ‘relational being’, a core idea in deep ecology, as well as in other branches of science, certain philosophic thinking, as well in diverse practices in art, architecture and design. Raphael has been exploring this concept and related ideas, such as notions of ‘zero’, ‘void’, space-time’ and ‘emptiness’, through his art practice as well as in academic publication. His has been an inter-disciplinary research, drawing on a history of ideas that span different historical periods, cultures, and academic fields of enquiry. For more information, please visit the TrAIN website. ‘Reflecting the cross-disciplinary nature of the British Library as an institution that spans the arts and sciences, we will host an exhibition created by artists on the Art and Science MA programme at Central St Martins and inspired by the Library and its science collections. The exhibition will take place from Monday 25 February 2013 until Sunday 24 March 2013. (Private view 27 February, 6-8pm). Open times are 09.30 – 5 pm. Free entry. This year, there has been an explosion of Anthropocene themed events: academic conferences, design shows and particularly art exhibitions, it seems. And there are more in the making: The Deutsches Museum in Munich is preparing the exhibition ‘Anthropocene – Nature and Technology in the Age of Humans’, the University of Bristol’s Cabot Institute has announced a symposium entitled ‘Society in the Anthropocene’ and publishing giant Elsevier is launching an ‘Anthropocene’ journal in 2013. What is the Anthropocene? The Anthropocene is not a fixed geological epoch as yet, but rather a proposal for one. Coined by ecologist Eugene Stoermer and popularised by Nobel-Prize winning chemist Paul Crutzen, the term translates as ‘The Age of Man’ or ‘The Age of Humans’. It basically implies that humans have come to dominate geo-physical activity on Earth and are affecting phenomena such as the planet’s climate at an unprecedented level. So far, scientists have not been able to agree on a date when the Anthropocene is supposed to have started: with the industrial revolution and its emission/population spike – or with the invention and proliferation of agriculture? I am not sure what exactly was submitted to the Geological Society in London in 2008, but whatever it was, the verdict is still out. In any case, the concept is increasingly gaining traction in popular discourse. What interests me most, at the moment, is the navigation between two areas: the geo-political, by which I mean the future of global politics and their response to planetary changes, and what at many events has been called the ‘geo-poetic’: ways of relaying the vast spatio-temporalities implicit in thinking geologically. When artists and other people produce Anthropocene-themed work, these areas often intersect, with varying emphases. It appears to be very much the same scenario as with, for instance, exhibitions on new technologies or environmental issues which fall into the category of ‘invisible risk’: artwork, computer games or other media trying to make tangible the scales we cannot experience (whether this is the atomic or the global scale), the causalities and consequences we cannot grasp (how do pesticides end up in Antarctic penguins? How come we cannot prove that leukemia cases near nuclear powerstations are causally related?) or the future trajectories we could help shape (e.g. the difficulty of taking action for far future intergenerational justice). D. Graham Burnett (Department of History, Princeton University) from Taubman College on Vimeo. Indeed, a theme that unites the majority of Anthropocene art and design based events is the capacity of these fields to ‘sensitise’ their audiences to their new role as a geological actant. As the artists from Smudge Studio put it, through their exhibitions they wished to make people aware that ‘geologic time is not composed of us – we are composed of it’. Many other examples were described in symposia such as ‘The Geologic Turn’ (organised by Etienne Turpin at the University of Michigan) or ‘The Geological Turn’ (organised by artist Gabo Guzzo with London’s Banner Repeater Gallery). These ranged from rocks as an object of scientific, philosophical and popular interest (e.g. Jane Hutton, D Graham Burnett, Edward Eigen), confetti cannons in which ‘each piece of paper matched to the colours of the brightest explosions in the universe’ (Katie Paterson’s 100 Billion Suns), the exponential curve as the new cultural meme (Seth Denizen) to the interactive creation of new representative diagrams for our era (Gabo Guzzo). The question that poses itself for me could be phrased as: ‘what happens after all this sensitisation?’ From my previous work, I have inherited the following tension: on the one hand, I have become extremely cynical about the ability of creative practice/affective methods to facilitate change/action/re-thinking by itself. Other things around it have to happen. In my work on public engagement with nanotechnology, I found that no matter now much creative practice you embed, if the channels that recognise or can process the outcomes of these creative engagements are not in place, nothing much at all happens (and what these creative practices represent to the audiences involved, of course, plays another role, but that is the subject for another post/article). On the other hand, it can be argued that ‘poetic interventions’ can help gather people round an issue – and these people can then put on pressure so that these channels are put into place. Working with this tension, I am trying to think about ways that artists, designers, social scientists can productively engage with it, especially when called on to put together ‘official’ public engagements. Rather than just looking at the interactions between art, politics and theory today, I am also guided in this endeavour by looking at theory-art relations at the turn of the last millennium, where people were wrestling with a change of world view brought on by a move from classical to non-classical physics and the transition from imperialist regimes to (democratic/totalitarian) nation states. At this time, the early and mid-20th-century, an explosion of creativity occurred, which also tried to bring into dialogue the geo-poetic and geo-political. The unifying theme of this time appears to have been the ‘inhuman’ of both matter and human interactions (I have started to explain this in my article ‘Negotiating the Inhuman: Bakhtin, Materiality and the Instrumentalisation of Climate Change, forthcoming in Theory, Culture and Society in March 2013), addressed by authors such as Hannah Arendt, Mikhail Bakhtin and Simone Weil – and artists in all fields, from music to painting (Artaud, Brecht, Meyerhold, Schoenberg, Auden, Dali, Duchamp…). Often, close links existed between artists and theorists. Here, the question for me is: what can we learn from these past experiments? What can we learn as artists, theorists, public engagement practitioners? I will post regular updates on the project, including relevant events and calls for submissions. Comments or e-mails are, as always, appreciated. Image source: Ari Daniel Shapiro. Image Credit: Alexander Semenov. You can listen to Ari’s podcast here. This PhD studentship advertisement just landed in my inbox. Please note that the deadline is 22 October 2012 for a start in January 2013. We invite applications for three AHRC funded collaborative doctoral awards on the theme of Engaging in Art/Science Collaboration: Communities, Visual Economies and the Spaces of Communication. Studentship to be based in the Institute of Geography and Earth Sciences, Aberystwyth University. Lead academic supervisor Prof. Michael Woods, lead non-academic supervisor Andy Rowlands. Studentship to be based in the School of Geography and Earth Sciences, University of Glasgow. Lead academic supervisor Prof. Deborah Dixon and lead non-academic supervisor Steve Keyworth. Studentship to be based in the Department of Geography, Royal Holloway, University of London. Lead academic supervisor Dr Harriet Hawkins and lead non-academic supervisors Nicola Triscott and Rob Le Frenais. The deadline for applications is 22nd October 2012. Interviews will likely be held 8th/ 9th November. The successful applicants will start in January 2013. These three PhD studentships explore the production and audience engagement, of the art/science projects produced by three organisations, who develop this work from within very different sectors; a large scale scientific project (UNESCO site Dyfi Biosphere, Wales), a geovisualisation organisation (Environment Systems, Wales and Scotland), and a leading cultural producer (The Arts Catalyst, London). These studentships will conduct ethnographic and practice-based research at these organisations and, drawing on the knowledge and expertise of partners, combine an exploration of the processes of art/science collaboration with a study of the diverse ways these art/science projects engage with multiple audiences, whether these be rural communities, scientists and science communication professionals, artists and gallery-goers, or the ‘general’ public. Collectively, these studentships animate and extend existing debates around art/science projects, and explore of these projects in relation to science communication and contemporary curatorial practices, pointing towards ‘lessons learnt’ and future trajectories. 1. Explore the imaginaries, practices and spatialities that animate art/science projects. 2. Ask how the organisations that produce these projects meet the challenges they pose. 3. Assess how art/science projects engage diverse audiences. Candidates may apply for more than one of the studentships, but may only hold one of the awards. The awards are funded by the Arts and Humanities Research Council, and the studentship pays post-graduate fees and an annual maintenance grant.